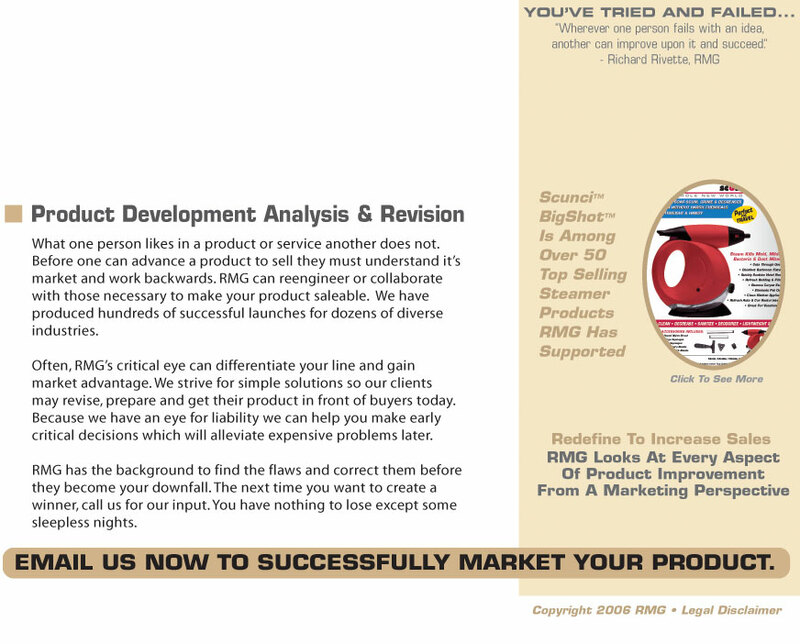 Rivette Marketing Group is a comprehensive marketing support company based in the U.S. We have 30 years of experience in product development, analysis/revision and new product creation. Our marketing support services, including: Comprehensive Integrated Marketing, Brand Imaging & Packaging, Emotion Driven Advertising, RFP & Business Plan Development, Market Lead Generation and Targeting, Direct Response Mail Marketing and Complete Advertising and Trade Show Services have assisted in the sale of over one billion dollars of brand name and other products worldwide. We regularly help overseas companies prepare for the U.S. market by upgrading their sales and consumer materials, brochures, and technical product instruction books. We have packaged or repackaged existing overseas brands for North America, creating new looks, features, and conforming to packaging requirements of the major retailers. Our expertise includes presentation construction for companies that desire introduction/sales to the larger stores across the U.S. and Canada. Our affiliates include marketing representatives capable of direct placement of finished retail goods.